Hello Dealsnloot Readers,Yes Flipkart Big Billion Days 2017 is going to live in this month. In this you will get Biggest loot sale, huge discount on so many categories, Upto 90% off on shopping, also extra cashback through PhonePe and SBI Bank Card. This time Flipkart will present so many offer and better deals from previous sale. 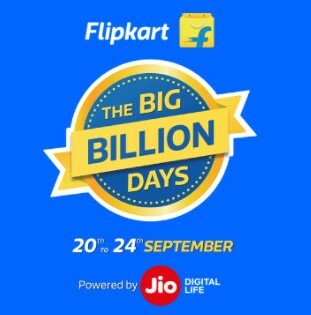 Flipkart Big Billion Day 2017 Sale will live between 20th-24th September.Last time it was a big success for them. This time they are planning something bigger and better this time.Now you can get much better and good deals than before. As usual this time also the sale will be conducted in some phases.So hurry Grab This Loot. 2. Then Login / Signup your account on Flipkart. Use PhonePe at Payment time in this Flipkart Big Billion Days 2017 Sale and Get Free 10% cashback in PhonePe wallet. No Min. Purchase But Maximum Discount Rs. 100. Keep checking this post to grab best loot deals on this Flipkart BBD 2017.